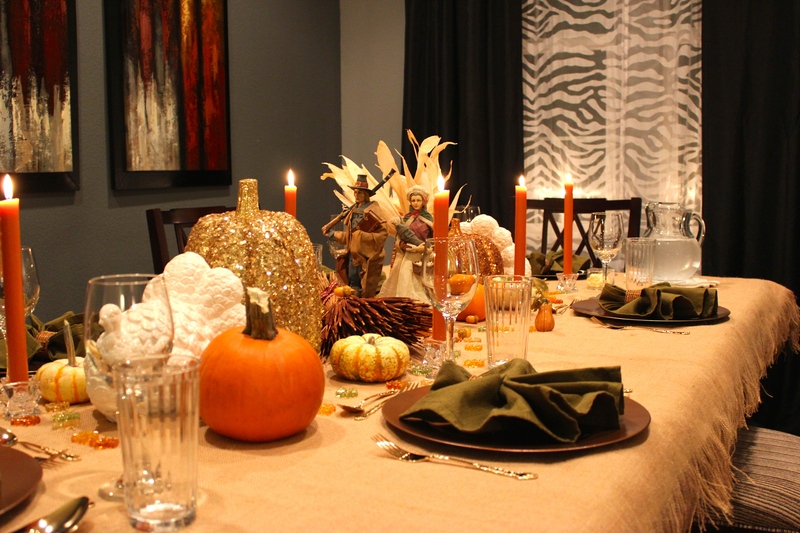 Normally I tend to plan far ahead for Thanksgiving, but for this particular Thanksgiving tablescape in 2013, I didn’t have a ton of time to get it together, so I decided not too sweat over it and kept it very subdued. I figure the Pilgrims didn’t worry themselves with too much fancy dinnerware and besides, and when it comes down to it, it’s all about the food anyway. I pulled out everything I had in various storage containers and my friend, Jennifer helped me set it. 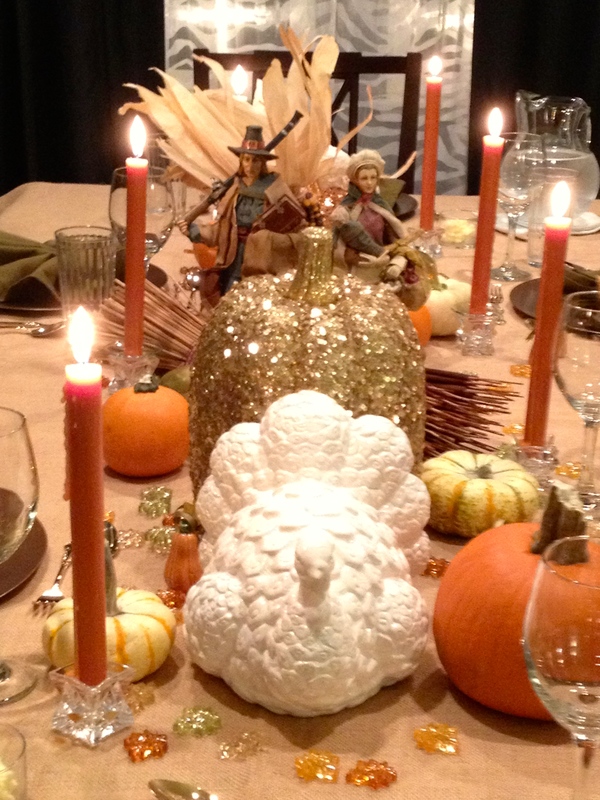 I use fringed burlap for a tablecloth and add various fresh gourds and pumpkins. Table scatters of glass fall leaves are tossed about and glitter and sequined pumpkins bring just a little bling and sparkle. The copper chargers are actually a DIY project with a can of hammered copper faux paint, and $.40 chargers found at the dollar store, these set a deep rich mood. 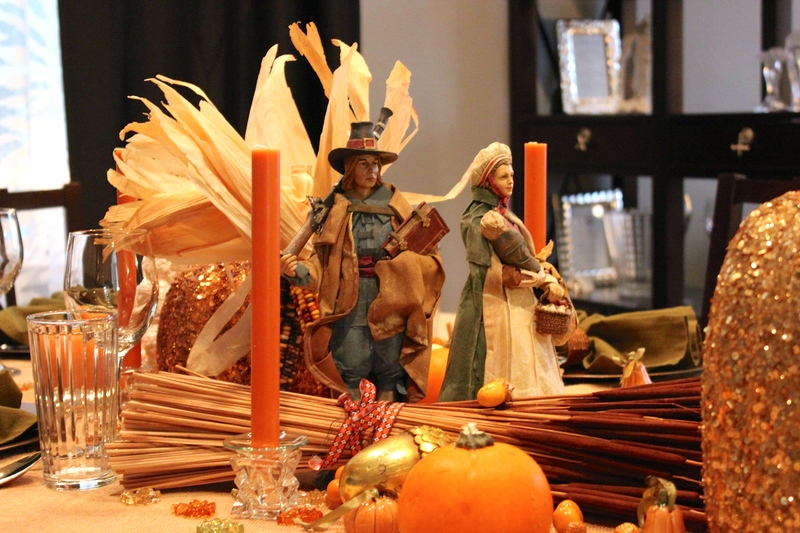 And a bundle of wheat and ornamental corn are laid on the table. I have various plates in mustard, deep burgundy, sunflower yellow, as well as earthenware plates I tend to use for Autumn tables. They are not only heavy in color, but also heavy in weight and it’s the perfect dinnerware for a rustic table. Two large ceramic turkeys flank each side of the table as if they are signaling what the day is all about. I found real copper napkin rings many years ago and I just love them. They are the perfect ring to go with deep olive green napkins. 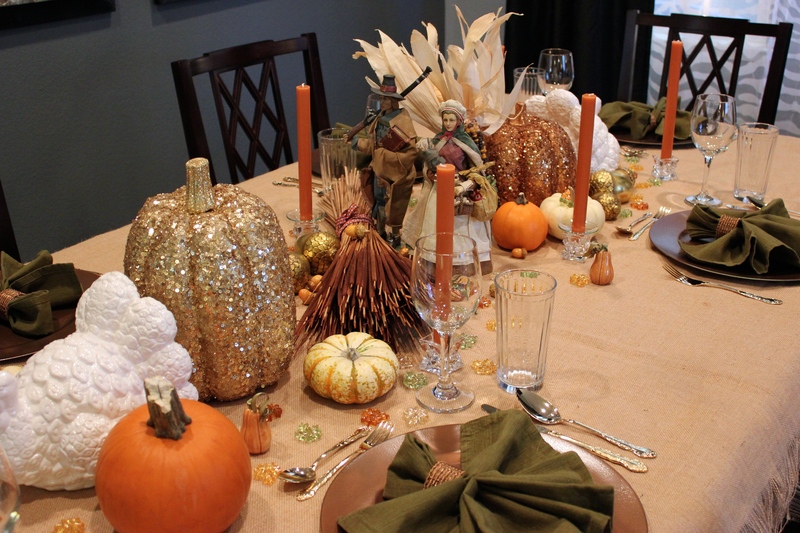 Gold flatware is the only expensive element of the table and they work out so well against the simple dinner plates. I even go with plain water glasses and wine glasses for drinks. Several years ago, Danny purchased this lovely Pilgrim couple for me. They always have a center spot at the table. 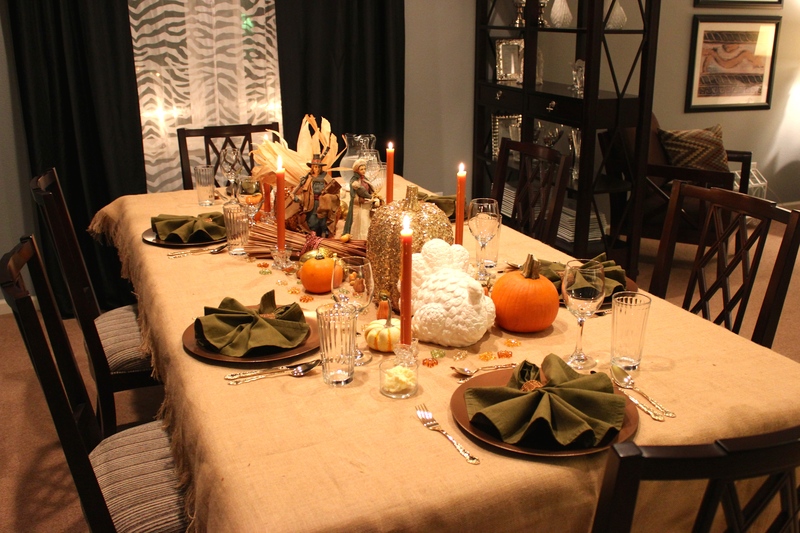 Plain crystal candlesticks are used around the table with dark pumpkin taper candles. They glow nicely and keep with the simplicity of the table. 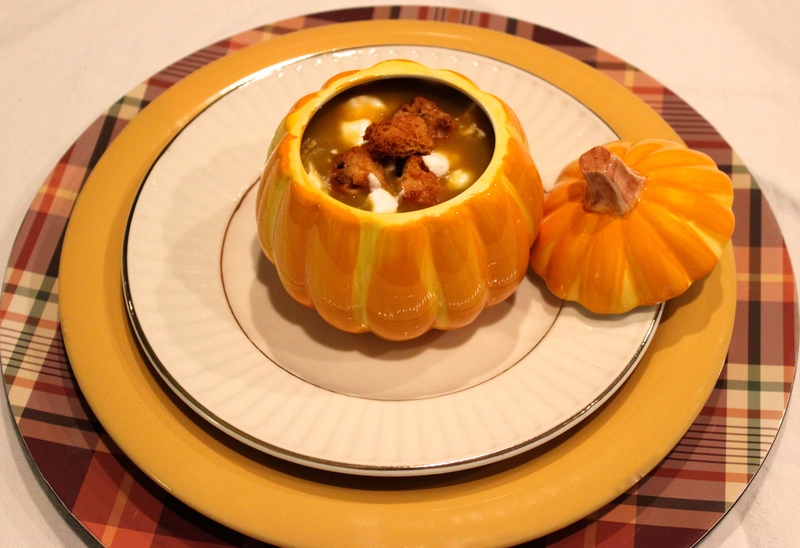 And even though I only use them once a year, I bring out my mini pumpkin tureens for some wonderful Fall squash soup. This one is a butternut squash pear soup with panettone croutons I was asked to make for a Thanksgiving food article. Happy Thanksgiving Everyone! Be sure to check out my recipe ideas for Thanksgiving leftovers!! I’ll post in in a day or two.